The term began in earnest as the children undertook a thrilling journey to Victorian England. Through this topic, they learned about the reign of Queen Victoria and what life was like for a Victorian child. We also studied the local area making comparisons between then and now. In English, we wrote biographies and incident reports using 'Oliver Twist' as a stimulus. We researched the life of Dr Barnardo and examined the impact that he made on the lives of children during this period. Towards the end of term, we took part in a Victorian workshop. Pinafores and waistcoats were at the ready! Our creativity was put to the test in science this term through our topic, 'Evolution and Inheritance.' We designed and created our own species demonstrating the characteristics they have developed to adapt to a particular environment. During the Spring Term we learned all about North America. We compared the geographical features of a country in North America with those of a country in Europe. We also identified the position and significance of latitude, longitude, the Equator, Northern Hemisphere, Southern Hemisphere, the Tropics of Cancer and Capricorn and the Arctic and Antarctic Circle. Towards the end of the term, our geography focus shifted to studying islands and natural disasters. In English we wrote legends based on native American Indian characters and produced magazine articles for travel brochures of North America and Europe. In addition, we used Ted Hughes poem, 'Wind' to explore figurative language. During World Book week we took part in an interactive poetry workshop and assembly led by the poet, Justin Coe who reminded us that we are surrounded by ideas for poems. 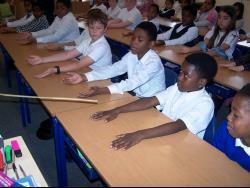 As part of our R.E focus on Buddhism we visited our local Buddhist temple to help consolidate our learning. The staff were extremely warm and welcoming and answered all the questions that we had. The visit generated some interesting discussions around the common shared beliefs across a number of religions. This term we will be learning about the importance of democracy focusing on the structure of our Parliament and the roles and responsibilities contained within it. We will run our own class election campaign alongside the forthcoming national elections (complete with class polling booths) to provide children with an insight into how it all works. In English we will be using the text 'Why the Wales Came' written by Michael Morpurgo, to consolidate and extend reading comprehension strategies. The text also provides ample opportunities to explore a range of different genres in writing including: formal letters, diary entries and character description.